Wednesday, March 28, 2018. The wait felt like eternity. Huddled behind closed-doors for a week, it took the 180-member Council of the ruling Ethiopian People’s Revolutionary Democratic Front (EPRDF) nearly all day to announce the winner. The entire country was on the edge. Ethiopian social media was gripped by rampant speculations, wild rumors and unsubstantiated “breaking news” reports. Some Ethiopians turned to humor to endure the insufferable wait sharing gif-worthy photos of themselves and others staring at TV sets or radios. The expected outcome was billed as the single most consequential decision in EPRDF’s history. There were three front-runners and four candidates for the premiership but the real choice was between the status quo and change. 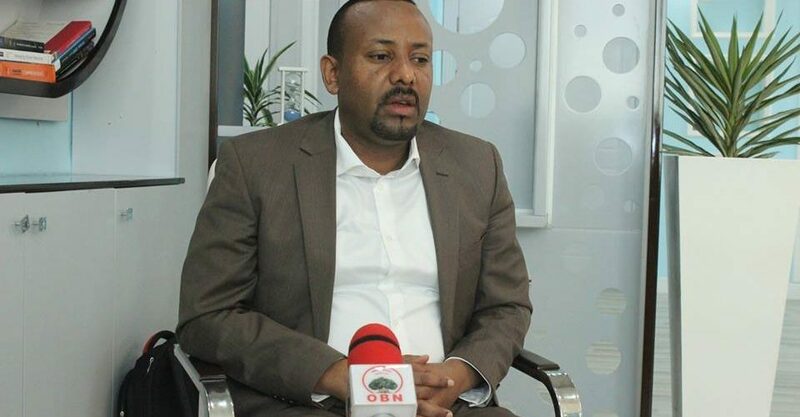 Unconfirmed reports that the EPRDF Council has elected Dr. Abiy Ahmed, chairman of Oromo People’s Democratic Organisation (OPDO), as its new leader began to seep out around 9pm local time. The state-affiliated Fana BC confirmed the rumors hours later. It is still unclear what went on behind the closed doors or why it took EPRDF so long to inform reporters, who were camping outside the meeting hall, of its decision on time. 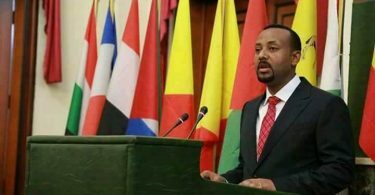 The 41-year-old leader overcame a relentless campaign from the “never Abiy” camp and won by a landslide, securing 108 of the 170 available votes. His closest rival received mere 59 votes. For the first time in Ethiopian history, a member of the country’s largest and traditionally oppressed Oromo ethnic group became the head of state. Many in and outside the country breathed a sigh of relief. Dr. Abiy, a quadrilingual who in addition to English speaks three Ethiopian languages — namely Amharic, Afaan Oromo and Tigrigna — is widely seen a reformer and the favorite among a narrow field of party insiders. Reactions are understandably mixed. The news of his election was greeted by impromptu celebrations across Oromia State and in Amhara. The media are characterizing his victory as the dawn of a new day. Many Ethiopians and Ethiopia watchers are cautiously optimistic. While the arrival of a fresh face at the summit of political power is enticing, we must not neglect one fact: The new Prime Minister leads the EPRDF, the same party that ruled Ethiopia with an iron fist since 1991. Activists worry that his appointment and public support may inadvertently legitimize the party’s iron-fisted rule. EPRDF and its sympathizers have been quick to emphasize the bloodless and democratic transfer of power. Whatever the case, the challenges that await the new leader cannot be understated. Ethiopia has careened off course for years. More than two decades of EPRDF’s authoritarian and developmental policies left unaddressed a litany of social issues and age-old grievances of economic and political marginalization. Despite a widely feted construction boom in the capital city with a plethora of high-rise buildings and newly paved infrastructure, the GDP growth is yet to trickle down to the masses who are struggling to cope with skyrocketing living costs and chronic inflation. The Tigrayan People’s Liberation Front (TPLF), the powerful member of the EPRDF coalition, still dominates key positions of power and have shown little interest to include leaders from other ethnic groups. TPLF officials still control all key posts of the army and national intelligence. They continue to look down upon members of the other coalition parties, particularly the OPDO and the Amhara National Democratic Movement (ANDM), as underlings and subordinates who owe their political positions to the former’s military victory against the communist regime. These concerns, coupled with growing resentment over rampant human rights abuses, official corruption, and the security forces’ willingness to detain, torture and kill dissidents, both real and perceived, have shaken the core foundations of the country. The 2014-2017 protests have reconfigured the political landscape by elevating Abiy Ahmed, the torch-bearer for the reformist faction within OPDO and ANDM. After quarter of a century rule by the power of gun, EPRDF understands a change is necessary to prevent public rage from boiling over. But unless the new leader sets real legal and political reforms in motion, a repeat of the protests of the last two years could spell Abiy’s early exit and the downfall of the regime itself. The Oromo and Amhara protests were sparked by deepening authoritarianism, massive crackdown against opposition activists and the excessive use force to quell peaceful protests. But some of the discontents, particularly in Oromia, the largest of Ethiopia’s nine-linguistic based federal states, predate the EPRDF. The Oromo protests were ignited by contemporary issues of dispossession and lack of freedom but it also includes century old systemic and institutional discrimination in all sorts of shapes and forms. For example, for most of Ethiopian history, the Oromo, who were once the target of assimilationist imperial campaigns by the Amharic speaking feudal overlords, suffered the indignity of being denied the opportunity to use their language in the workplace or even as part of regional educational curriculum. When the EPRDF, flanked by a contingent of Oromo rebels and others marched on Addis Ababa in 1991, it promised to usher in a new era of equality. It allowed the newly constituted Oromia state to use the Oromo language and promote the Oromo culture, but Ethiopia’s prison population remains disproportionately Oromo. 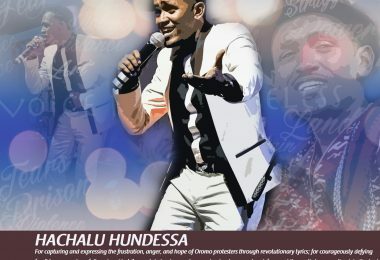 Tens of thousands have been arrested on trumped-up charges of affiliation with the banned Oromo Liberation Front (OLF), a rebel group founded in the 1970s to advance Oromo rights. The EPRDF regime has used the OLF card to clampdown on Oromos from all walks of life who chose to speak out against those in power. An Oromo revolt always appeared inevitable. But in 2014 when the Ethiopian government announced plans to extend the territory of the capital, Addis Ababa, into surrounding Oromo plains, the realization that the impoverished Oromo farmers of these lands would likely be displaced with little to no compensation became the last straw. Oromos protested en masse first in 2014, then again to greater effect in 2015 and 2016. Spontaneous protesters took over college campuses, city streets and towns across Oromia in the hundreds of thousands. They shouted slogans condemning the ruling party. They were united by the crossed-arms-gesture made famous by marathoner Feyisa Lilesa at the Rio Olympics. The Amhara, who were also among guerrilla fighters that overthrew the Dergue, favored a centralized Ethiopian polity. Ethno-nationalists often accuse Amhara elites of ambivalence on the ethnic-based multinational arrangement. Nevertheless, ethnic Amharas took issue with a 1995 EPRDF demarcation of the Amhara and Tigray state borders. The newly drawn up boundaries placed the Wolkait-Tegede strips of land inside Tigray. Many residents of Wolkait, who feel culturally and historically Amhara, decried the lack of proper referendum or consensus on the issue and viewed the controversial demarcation as an illegal annexation of Amhara land. The government refused to reconsider the move. 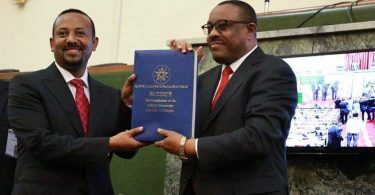 In addition, EPRDF’s disputed pact with the Sudanese government saw Addis Ababa hand over a territory the Amhara believe is theirs to Sudan, added to concerns about the TPLF-led regime’s attempts to cleanse the area of Amhara. Those concerns were reinforced by muted official reaction to multiple reports of ethnic Amhara inhabitants of other regions being killed or forcibly evicted. The detention in 2016 a committee elected to present the Wolkait question to government officials ignited the Amhara protests. The protest movement caught fire quickly; expressed solidarity with Oromo protesters who were being killed and rounded up in Oromia. The two protest movements and their common demands for freedom and democratization led to an unprecedented crisis not seen in the EPRDF era. The uprising was eventually put down but only after the regime waged a war against civilian population in the two regions, who together represent two-thirds of the country’s total population. More than 1,000 unarmed demonstrators died from December 2015 to October 2016 when the federal army and special forces, deployed with orders to quell the unrest using all means necessary, used lethal ammunition against protesters. An October 2016 declaration of a state of emergency, the shutting down of internet and phone services across the country and the mass detentions of thousands of people, brought a lull in protests. But the damage had already been done. Foreign embassies begun to issue travel advisories advising their citizens against non-essential travel outside of the capital. The economy and tourism industry incurred heavy losses as investors packed up and left a country now deemed unstable for business. Even Addis Ababa, normally cordoned off from the instability in the surrounding countryside, saw a protest on August 6, 2016 where baton wielding federal forces viciously beat protesters as foreign cameras rolled. EPRDF leaders have since conceded that people’s fear of authority was diminishing rapidly and that it might be unable to sustain a second round of mass protests. The myth of the regime’s invincibility had evaporated as sit-in protests, market boycotts and roadblocks along major highways, the country to a virtual standstill. With the balance of power shifting, at long last, the OPDO and ANDM rose to the occasion in response to the pressure from the streets. A notable rise in their influence emerged as ANDM and OPDO MPs started to set demands, chastise decisions taken by TPLF MPs and went to great lengths to make themselves heard during parliamentary sessions. No longer content to stay bystanders, Oromo and Amhara politicians in the EPRDF capitalized on the waves of demonstrations and begun calling for political reforms. Party meetings became noisier affairs. It was a late realization and a dire reality. The differential and lopsided dealings with TPLF leaders became a thing of the past. Prime Minister Abiy and his colleagues climbed the ladder of influence during the brief calm after the storm of October 2016. 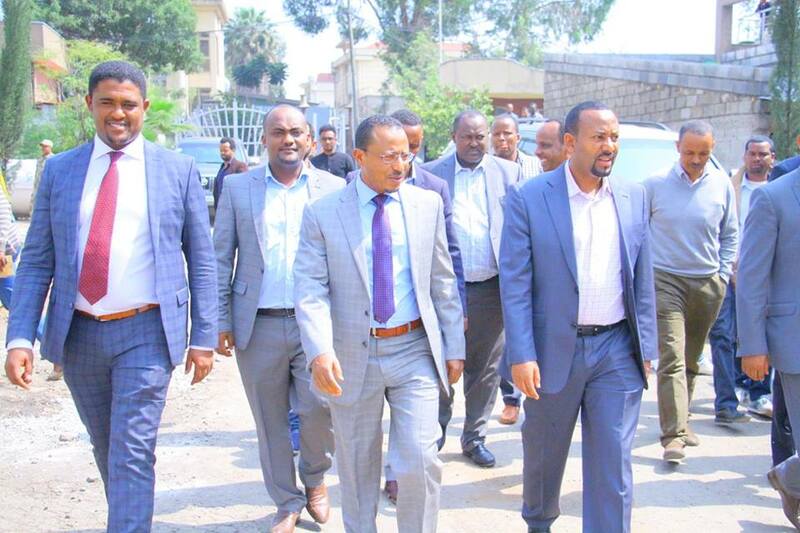 The popularity of OPDO leaders, in particular Oromia State President Lemma Megersa and State Communications Affairs Bureau head Addisu Arega, went through the roofs. They quickly became symbols of the EPRDF’s inner dissent. ANDM and OPDO MPs forged informal alliances and leveraged their numerical advantage in the legislature. On one occasion, they forced former Prime Minister Hailemariam Desalegn, who was away at an Executive Council meeting, to make an unscheduled appearance in parliament. Threatening to boycott parliament, they took issue with the leader’s silence in the wake of the displacement of hundreds of thousands of Oromo and Somali civilians by deadly communal clashes along the two state’s common border. At the start of 2018, the weeks-long Executive Committee meeting came to an end. At a press conference, Hailemariam announced the release of political prisoners and promised to begin dialogue with the opposition. In Ethiopian circles, it was clear that the concessions were a result of the ANDM and OPDO alliance. The two docile partners have successfully forced the TPLF’s hand. With the threat of more unrest looming, the fresh breed of OPDO and ANDM leaders had clearly put to use their newly gained political muscle. This paved the way for the releases of thousands of political prisoners, including some of the most renowned personalities in the nationwide struggle for justice. Bekele Gerba, Eskinder Nega, Colonel Demeke Zewdu, Ahmedin Jebel and Merera Gudina walked out of prison in January and February and into the embraces of thousands of celebrating supporters and loved ones. Toward the end of January, a fresh bout of protests in the Amhara region were once again dealt with by employing disproportionate use of force. Starting with the Woldia massacre, where about a dozen people were killed on January 20, the week ended with around 20 more protesters shot dead by security forces across Wollo. Since then, protests have flared up sporadically across both the Amhara and Oromia states. On February 15, Hailemariam abruptly resigned from his post. A day later, a state of emergency was declared in an effort to put an end to protests which included sit-ins, market boycotts and rallies. Led by a military Command Post, which has become the supreme authority of the land, the disputed state of emergency has suspended the constitution. The decree prohibits everything from criticizing officials on social media to gathering in large groups. Security forces continue to act with impunity, detaining government critics, scholars, members of the local law enforcement and high-ranking Oromia officials. Authorities put the number of those arrested at a little over 1,100 people. Activists say the number is much higher. Sandwiched between the spate of arrests was that massacre of civilians in Moyale, which eventually caused tens of thousands of the city’s inhabitants to flee across the border into Kenya. As long as the emergency decree remains in place, optimism that EPRDF is on course for a radical change will be greeted with skepticism. Besides, there have been no accountability for the massacres of thousands of protesters or the displacement of 1.3 million civilians. Only days before Abiy’s election, upto 30 people, including many former political prisoners were thrown back into jail in massive roundups across Addis Ababa, Oromia and Amhara regions for simply congregating in large numbers. Abiy ascends to power at a time where public confidence in the regime is at all time low. The country’s security apparatus remains a TPLF monopoly and unlikely to change its approach in dealing with dissent. This is what earned Hailemariam the distinction of being a powerless figurehead with no real say during his nearly six-year tenure. If the incoming Prime Minister aspires to build on the current goodwill and earn the backing of even more Ethiopians, he must revamp the way the country is governed. For one, justice and accountability are required. Unlike Hailemariam, Abiy has a military and intelligence background which could serve him as an asset in reforming the security sector. He should leverage his background and influence to decentralize the state power and curtail the dominance enjoyed by TPLF. This could mean replacing military and intelligence leaders with a multi-ethnic team of individuals less willing to mobilize the army at a moment’s notice, or gain control of the harnesses of the military institution himself and become the real commander-in-chief that his predecessor could not be. Repealing the state of emergency and pulling back the Command Post would also be a strong signal that there is a new sheriff in town. The OPDO has already shown that they can negotiate with protesters if given the opportunity. A three-day sit-in strike called in February was cancelled a day early after the releases of political prisoners made possible by OPDO’s lobbying. The youth or “Qeerroo” led movement have shown remarkable patience and a willingness to negotiate. Abiy should capitalize on this and open up the political environment. But he can only enact the changes that would bring much-needed dialogue between the opposition and government if he boldly insists on implementing the constitution – not the party’s diktats – and courageously stands up to the military and security establishment. The dire social situation in Ethiopia is the result of EPRDF’s refusal to allow even the slightest form of dissent. Internationally renowned as a leading jailer of journalists and activists, the majority of credible Ethiopian media outlets are based abroad. Journalists are routinely forced to flee the country or face lengthy imprisonments. The ones who do stay operate under highly restrictive conditions. This has left many feeling excluded or muzzled, as the only media outlets that work unperturbed are the ones parroting state narratives. If the new PM wants to usher in an era of reform he could start by curbing the policing of the media. Journalists should be able to work and amplify the many voices in the country that would otherwise never be heard on the singled-celled state networks. Another bold step would be repealing or amending the 2009 anti-terrorism proclamation, which is widely seen as a legal tool to stifle dissent and justify the detaining of opposition activists and members of the media by charging them with terrorism offenses. The public grievances in Ethiopia are too many to list. Surely, all of them cannot be addressed overnight. But the new leader can lay the ground for further reforms by securing the most basic of freedoms. The promised dialogue with opposition should begin in his first 100 days in office. Throughout the regime’s 27-year rule, any such dialogue could only be held in neutral third countries due to the risk of participants being detained afterwards. For instance, members of the Wolkait Identity and Self-Determination Committee, who only sought to have sincere roundtable discussions with the government, should be given that opportunity. In 2016, security forces went to their residences and arrested them one-by-one. They were released nearly two years later. People will have less of a reason to take to the streets if their legitimate representatives are given the platform to discuss their causes and ideas. The regime’s protocol has always been to hunt these people down and silence them. Abiy must eschew this practice to stop even more enraged youth from returning to the streets. Finally, to bring about some sort of reconciliation between the state and the people, it is time that the new leader visits the cases of the countless people put behind bars during EPRDF’s tenure. Despite the feted releases of prominent political prisoners this year, tens of thousands remain behind bars. The list includes orthodox christian monks and countless suspects accused of ties to OLF who should be considered for immediate exoneration. Broadly, their freedom must be followed by freeing the judiciary from the shackles of the executive branch. For much of the past 27 years, the courts have served as an extension of the ruling party, working in tandem with prosecutors, prison administrators and torturers to punish dissidents and opponents. Many of those who still remain behind bars were sentenced to lengthy prison terms on trumped-up charges. A truly apolitical court of law would see the cases against most of them vacated. Exonerating those who are unjustly incarcerated would be a massive step in healing wounds and setting the stage for reconciliation. This would require the new prime minister forcing the TPLF dominated military-security establishment to stop meddling in the affairs of the judiciary. To do so would secure the legitimacy of the court, ensure justice and prevent judges from being agents of illegal punishment against critics. A lot would be demanded of the new leader if he is to prevent the country from implosion. Halting TPLF’s factionalism and destructive self-serving policies won’t be an easy task. But if the EPRDF is to salvage its checkered legacy, it would have to eject the poison in its blood stream. This poison emanates principally from the inflexibility of the Tigrayan autocrats and their cronies who have monopolized state power for much of the past 27 years and are responsible for Ethiopia’s social, political and economic stagnation. Many are skeptical that someone from the one-time obedient OPDO could shake loose the piranhas that have sunk their teeth deep into the country’s engine room. But Abiy does have the fresh impetus of riding the tidal wave of a massive protest movement into the highest office in the land. He knows that he is perhaps the only EPRDF candidate nominated to replace Hailemariam who stands a chance of being listened to in the opposition hotspots. Will he capitalize on his unique place and make the most of the opportunity? TPLF likes to remind opponents of its allegedly “outsized role” in defeating the Dergue. It has firmly entrenched itself in politics and the economy. The Marxist-Leninist group is unlikely to relinquish power without a fight. In fact, its leaders and supporters are expected to resist attempts to reformat the country’s governing structure, especially if it means accountability for illicit outflow of capital, contraband trade and massacres of unarmed protesters. Abiy has people power behind him in the short run. He will need to tread careful not to squander the public goodwill and hunger for change which swept him to the Menelik palace. He doesn’t have 27 years. Patience will quickly dissipate. The emboldened opposition is likely to turn up the heat if he is seen as indecisive. He must hit the ground running on day one to tackle the mammoth challenge ahead. 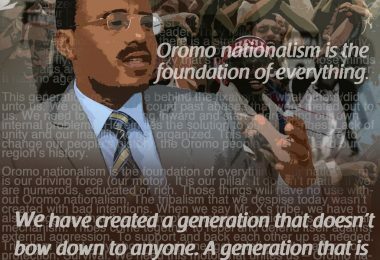 For Abiy and the EPRDF, it is now or never.